During the World Series, we revealed that newly inducted Hall of Famer Ken Griffey Jr. will grace the cover of MLB The Show 17. The Kid’s signature style transcended the baseball diamond and helped create some of the most memorable baseball video games of the 90’s. Most of us at San Diego Studio grew up playing those classics and wondered how we could recreate a nostalgic feeling for a generation of gamers. To answer the most obvious question: nope, your eyes did not deceive you. At the very end of our PlayStation Experience trailer you caught a first look at a new game mode for The Show 17. Introducing “Retro Mode,” a retro gameplay experience that pays homage to the classic baseball games many of us grew up playing. 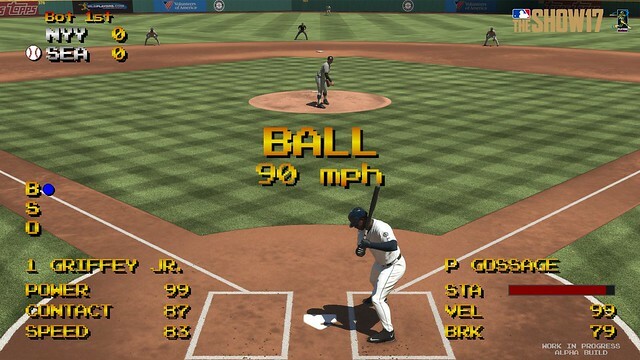 Retro Mode allows you to move the pitcher across the pitcher’s rubber and move around the batter’s box with ease, classic on-screen displays, an old school soundtrack, unique sound effects, a throwback pause menu and more. Retro Mode is entirely separate to the popular Road To The Show, Diamond Dynasty and Franchise game modes. This new way to play MLB The Show is designed to be a fun, throwback game mode that instigates battles on the couch with friends. We’re not diving deep into those modes just yet, but there are a few teases about the changes coming to RTTS, gameplay additions and a couple of other things we snuck into the trailer for our eager fans. Some changes are more obvious than others and we’ll take a deeper look very soon in case the untrained eye missed a clue (I’m guessing our biggest fans will find most of them by the end of the weekend). We’ve only scratched the surface on the feature set for MLB The Show 17, so stay tuned for info in the coming weeks. And if you’re at PlayStation Experience over the weekend be sure to come by the MLB The Show bar and try out an Alpha build of Retro Mode. In the meantime you can pre-order now and please make sure to watch The Show Nation and our Twitter and Facebook accounts between now and March 28th for the latest updates.